House Plan # 5134 - Square Footage - 819 1st Floor, 579 2nd Floor Total 1,398 sq.ft. 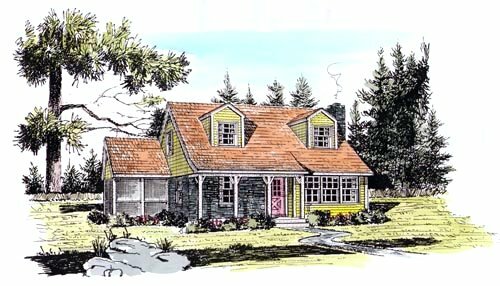 House Plan #5134 - Comfortable designs like this are at home in any setting, whether it be the lake, beach or mountains. Traditional wood clapboard siding and stone heighten the home's appeal. Home Design # 5134 has a living room, dining room, kitchen, bedroom and bath for a first-floor total of 819 square feet of living space. The upstairs is an expansion attic with some 579 square feet for two bedrooms and a bath. The upstairs may also be left as storage. There is a laundry room and a screened-in porch. The overall dimensions of the house are 29'-2" by 29'-4". Square footage for the first floor is 819.4' and for the second floor 578.5'. There is also a full cellar.